These classic images of the Campbell’s Soup cans are some of Warhol’s most iconic works. His use of black and white, and the strong red creates dynamic graphic imagery, which harks back to his graphic designer days, and creates a very eye-catching piece. Vegetarian Vegetable Soup by Andy Warhol demonstartes his obssesion with consumerism. Warhol’s use of consumer items is nothing new, he was fascinated by consumer goods, and experimented with them throughout the 1960s. This is not the first time Warhol produced the soup cans, they were first exhibited six years earlier, as 32 canvases at the Ferus Gallery in Los Angeles. It is with this series that you can really start to see Warhol’s process start to evolve. He was really starting to perfect the semi-mechanized processes he is most famous for. Warhol also continues with the idea of repetition and how it can remove meaning from the object or whatever else is being depicted. Vegetarian Vegetable Soup by Andy Warhol is just one of teh many soup cans he used as place holders for emptiness. Warhol continued to experiment with the soup cans, by altering them and contorting them. But these classic soup cans remain the most sought after of any soup cans, even bringing in new collectors. By repeating the same image at the same scale, Warhol stressed the uniformity and ubiquity of the Campbell’s Soup can. At the same time, Andy Warhol used the Campbell’s Soup cans in order to subvert the idea of painting as a medium of invention and originality.Repeating an image over and over again is something that can be found frequently in Warhol’s work. One of the main reasons for this is because he felt that serial repetition drained an image of its meaning. This interpretation becomes increasingly important in a portfolio such as the Disaster series. Also, the use of everyday objects is not something new. Warhol had worked with Coca-Cola bottles and dollar bills and was continuously interested in objects of mass consumption and American society with them. Warhol continued to work with the Campbell’s soup cans, altering and contorting them, but these classic cans remain the most popular and sought after by collectors. While Warhol is mostly associated as a New York artist, he did have a connection to the California artists in the early-60s. 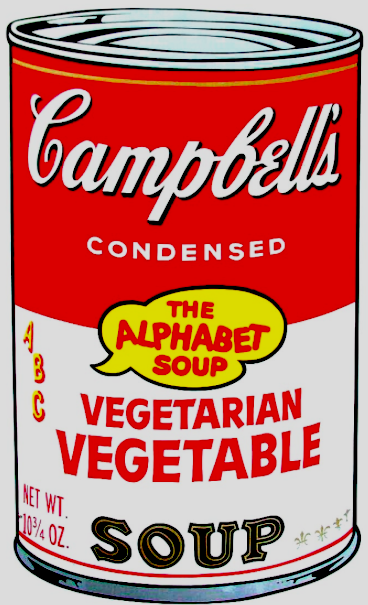 The original 32 Campbell’s Soup paintings were shown at the Ferus Gallery in Los Angeles.Vegetarian Vegetable Soup by Andy Warhol is available for sale at Guy Hepner as a print.